Marks and Spencer’s, founded in 1884, has enjoyed 120 years of steady, managed growth, surviving two world wars, depression, post-1945 austerity and, it seems, the financial crisis of 2008 – 13. In 1920, the store started to sell underwear and at the outbreak of the second world war it began a range of utility clothing. Food (poultry) was added to its range of products in 1960. Ten years later convenience foods were introduced. In 1998 it was the first British company to make a pre-tax profit of over £1,500m, with a turnover of £8,243m, realising a net profit of over £815m. The previous year, with a turnover of £8,214 worth of business, it recorded a trading profit of £1,129m (just over £746m net). In 2013 the company netted over £10m worth of business, with a pre-tax profit of £560m, and in the years 2010 – 12, comparable returns were reached. At the end of last year, sales overall were almost 2% higher than the previous quarter, with food and international sales rising even above this figure. The company regularly outsells its rivals on “Key Event Days” such as Valentines Day and Mothers Day, for example. However, it is not all sweetness and light, when looking at the popularity amongst target customers (in this case older and younger women) of the traditional Lady Wear brand. Though share prices rose 3% as recently as Aprill 11th 2014, they soon fell back, suggesting the company is losing out to outlets viewed as trendier, and cheaper, than Marks and Spencer. The issue also applies to men’s clothing designed for the youger age group. However, whereas in the past the company has been slow to address such negative sales problems, it seems to have learned its lessons with the successful development of its website–business in 2014 is up 12.5% on 2013. Yet overall, the future does present a challenge, and not just to the clothing department. companies like Aldi and Lidl have introduced stiff price competition to the market. In the past, M&S has built its commercial success on quality advertising campaigns, using high profile celebrities like David Beckham and Joanna Lumley to promote its clothing brands. But these are the stars of yesterday. The store’s more recent campaign featuring Emma Thompson and Doreen Lawrence is an attempt to attract the successful older women who, traditionally, have been the business’s most supportive demographic. But even here there may be a problem: Women often complain that the media continually ignores this section of the buying public. Which, by turn, means the sales and success they give Marks and Spencer will go largely unnoticed. The great, benevolent caveat to the modern day trials of Marks and Spencer is that it is now an international business rather than simply a British one. It has expanded into the middle class markets of the future, in China, India, Eastern Europe and even the Gulf States. Soon, Russia and Brazil will offer huge potential. 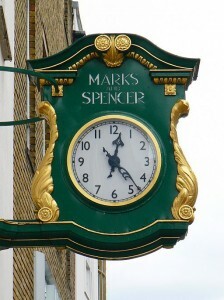 And when Marks and Spencer’s core strength remains in its reputation for quality goods across a wide variety of products, it is safe to assume that it will remain a staple of Britain’s shopping markets. Terry Jones taught History to adult students taking Foundation courses at a College of Higher Education prior to their entry into full-time degree courses at Warwick and Coventry Universities. Since taking early retirement, he has travelled widely in Eastern Europe, pursuing a life-long interest in 19th and early 20th century European history. He has been a GCSE and "A" level tutor with OOL since 1996.